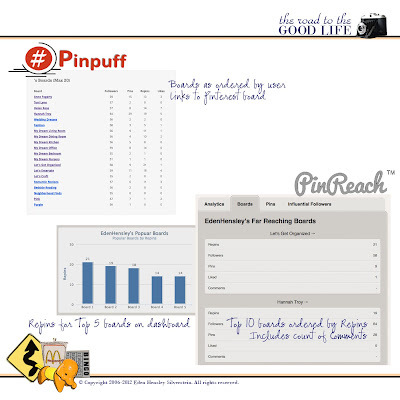 Today I look at two online tools for determining your Pinterest influence -- Pinpuff and PinReach (formerly PinClout). Both of these are in early development. Side by side, Pinpuff has the edge right now, giving the best breakdown for influence on Pinterest. Pinpuff doesn't dive into effectiveness of specific content - for example, most popular repins or likes. If you want to see most popular repins to judge effectiveness of your content, you'll also need to periodically check PinReach. Currently neither tool shows you which content is most liked. 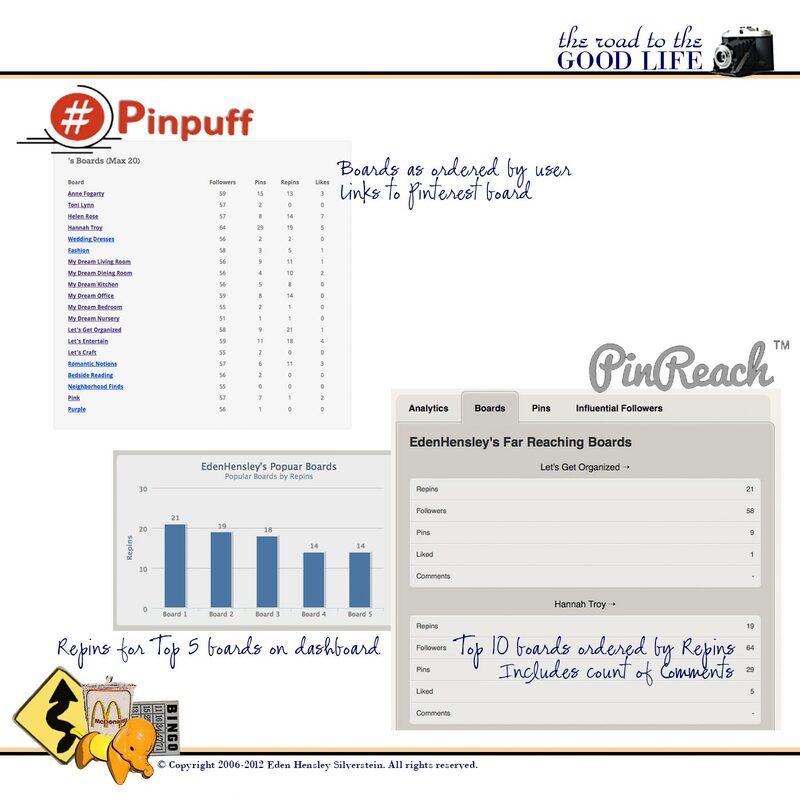 Pinpuff measures your Pinfluence, "a relative measure of your popularity, influence, activity, reach (& celebrity levels if applicable) on Pinterest on the scale of 100. It also decides monetary value of your pins & traffic your pins generate." 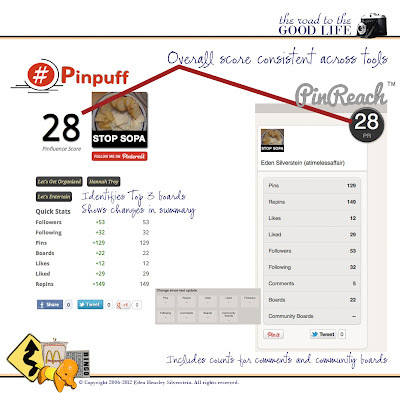 Average pinfluence, according to Pinpuff, is approximately 32, with a good score being 50 or above. Pinfluence is comprised of three components: Reach, Activity, and Virality. 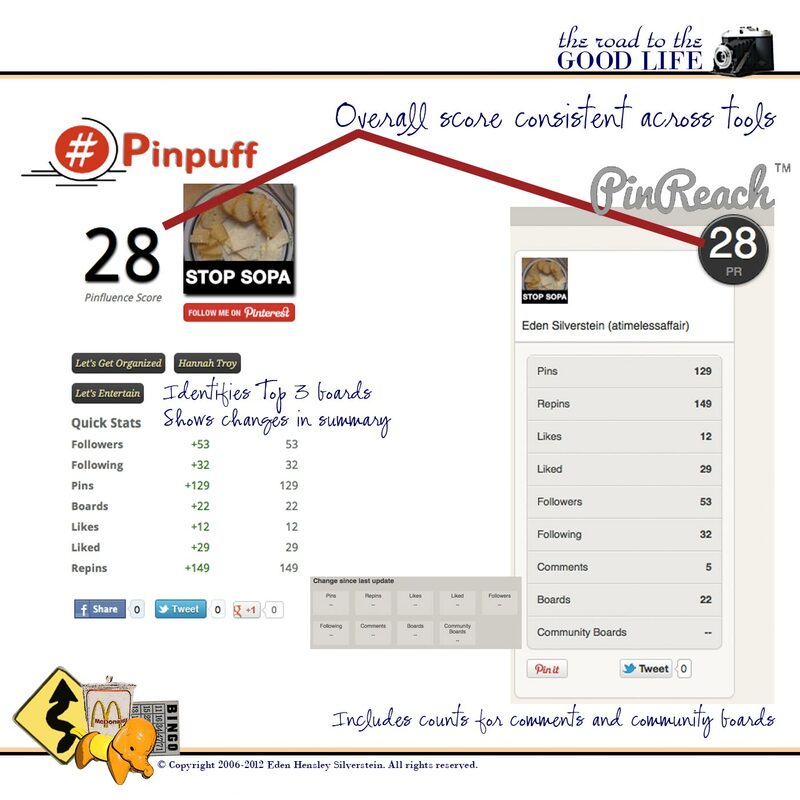 For each component, Pinpuff provides context as to whether the score is below average and includes tips for improving. Unfortunately, Pinpuff does not currently track your score and its components over time. To view history, you need to create your own chart using Excel by regularly calculating your pinfluence, recording the score and component metrics, and generating your own graphs. 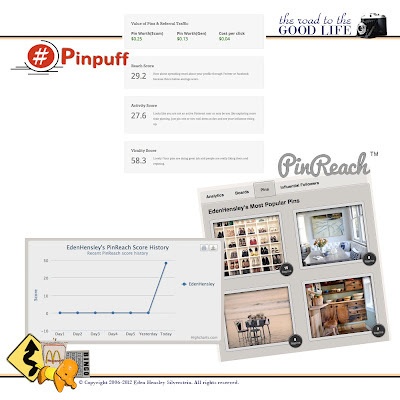 PinReach is "the source for Pinterest analytics. [They] are working to empower people and brands with the tools necessary to monitor trends, understand activity, and gauge impact, easily." 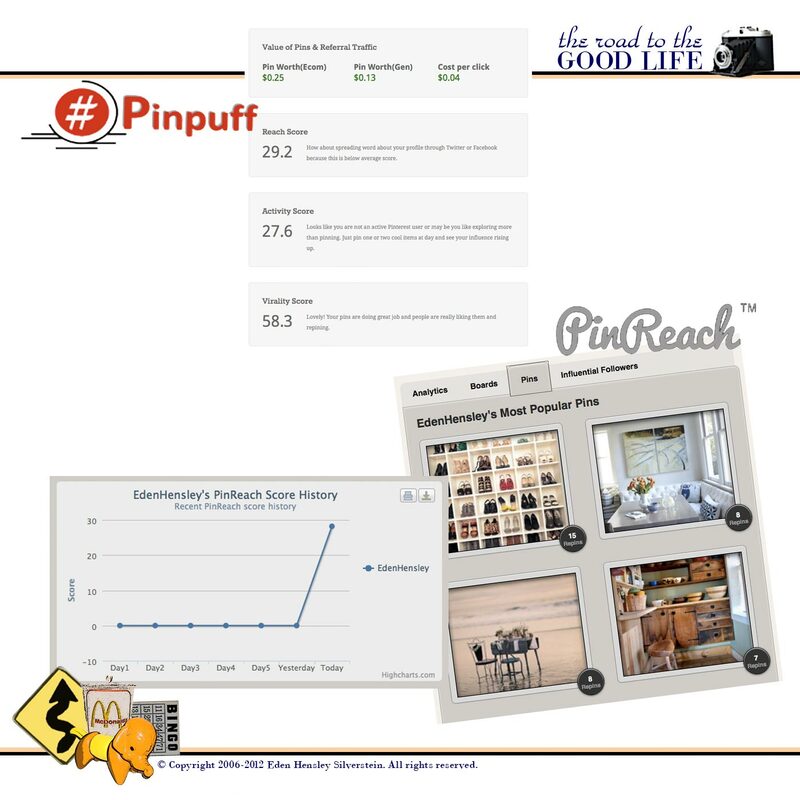 With PinReach you can view an overall score, as well as statistics on popular boards, popular pins, and more. PinReach, like Pinpuff, also has limitations. Currently unlike Pinpuff, PinReach does not mention how its overall score is calculated or state what an average score is. It also doesn't provide tips for improving ones score. How are you tracking your influence on Pinterest? Credits: All images taken by Eden Hensley Silverstein for The Road to the Good Life.